From Sydney With Love is shoddily executed mashup of many romantic films of the past. Watch it if only if you have nothing else to do. Released on 31-8-’12 at Inox (daily 1 show), Metro Big (daily 2 shows) and other cinemas of Bombay by Pramod Films. Publicity: good. Opening: poor. …….Also released all over. Opening was weak everywhere. Written-Directed-Produced by Prateek Chakravorty, the movie is a comeback of the renowned banner Pramod Films who had made 'n' number of melodious hit movies since 50 years. 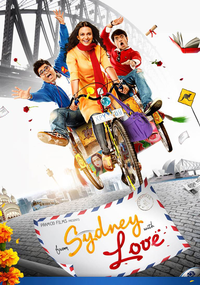 The movie is filled with newcomers and was touted to be as a family entertainer. Rohit loves Megha . Megha loves Rohit. But Raj love Megha too. But Lubaina loves Raj. All this and more against the backdrop of Sydney harbour.